I just wanted to share what the Little One will be bringing for her Easter Party at school tomorrow. I signed up for "fruit" and "other". I had originally planned to do some cute fruit kabobs, but just decided for some simple apple slices. 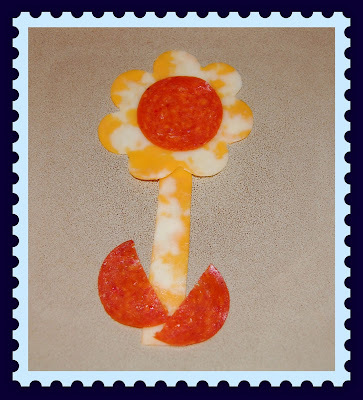 For the "other" category, I came up with this little cheese and pepperoni flower. I just used some Colby-Jack cheese and cut a flower shape with a cookie cutter. The flower center is pepperoni as well as the leaves (cut in half). For the stem, I just cut a rectangular shape from the leftover cheese. This is super-simple and super-quick! I found your blog on Pinterest. I love it! I often sign up for "other" then if you think of something really cute you can bring your great idea! God Bless!